Hunger: One common issues which one is likely to experience is hunger and sleep. When one sleeps, the body doesn't sleep, it works to repair the tissue and muscles for the body to do its function. If we deprive ourselves of sleep, we crave for food. Which result us in taking junk food which result into GI issues. When the brain is not relax, it produces ghrelin (hunger hormones) while a relax mind produces leptin (hunger suppressing hormone). So if one is not sick,It would be helpful to get quality sleep at the right time. When you don't sleep you risk being obese and obese people wakes up from sleep for acid reflux or chest pain. GERD, Heartburn and Sleep: It is also worthy of note that one should avoid sleeping with his right side, this is because the stomach which is of course linked with the esophagus contains gastrointestinal juice that could return through the esophagus because of gravity. This could lead to heartburn. 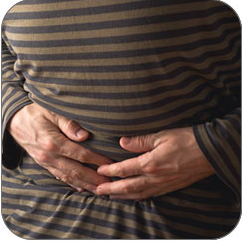 Gastroesophageal reflux diseases (GERD) comes with the symptoms of heartburn and acid reflux. Almost 74% of sufferers wakes up with nighttime heartburn. When acid flows back through the esophagus, it wakes up victim with choking and coughing causing them insomnia. GERD affects 10-20% of Americans. Irritable Bowel Syndrome (IBS): IBS is also one of the stomach issues that sufferers complain of insomnia.The bowel movement caused by IBS comes with pain which hinders them from sleeping. Most of them also suffer fibromyalgia. Develop a sleep routine: One could relax the mind, body and stomach with a consistent bed time routine like taking a warm bath or doing yoga. one could also decide to take good herbal tea and melatonin would really help you for sleep. I'll prefer one consider Melatrol it's a natures way supplement for melatonin. Prepare for midnight episode: If one is living with chronic heartburn, IBS or digestive issues, it is important he/she aspect it in good fate and prepare to make sure one calms down the mind again before going to bed. One could decide to read a book and wait till one gets tired and falls asleep again. Check your sleeping position: We already advice that the sleeping position affect the stomach. If one must sleep by the side, we prefer one uses the left side. If one would want to lie on his back, one should consider wedging his head with a pillow. Reduce stress: One need to learn to reduce stress for the mind, to relax and enable the sleeping process. One could do it by say learning yoga, meditation or seeing a TCM expert for acupuncture.